Although Lewis Hamilton took the official trophy in fine style at the final race of the year in Abu Dhabi, he was to be overshone in the end of season wrap up ratings here on Sidepodcast. Daniel Ricciardo, the chirpy Australian, took top honours when it comes to the performance of the year. Over 100 people voted in our poll to pick the driver of the season, and Ricciardo came out on top with 41%. Lewis Hamilton was second with 23%, whilst Fernando Alonso and Valtteri Bottas took 13% and 11% respectively. These being the top four doesn't come as a total surprise, they fought valiantly in 2014, but the order they ended up in is fascinating. 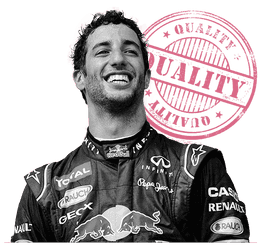 Dominating a quadruple world champion teammate, overtaking all comers every which way he could, retaining a positive attitude throughout and generally being an all round good egg means that Daniel Ricciardo gets the Sidepodcast vote for best F1 driver of 2014. This makes him a double Sidepodchampion, as the reader vote crowns him best driver, and he also scooped the Christine's Rankings title this year as well. Is there anything Ricciardo can't do? I had a look back at which driver scored the most individual driver of the day plaudits as well. Across the course of the season (18 races as we opted not to have a poll after Japan), both Daniel Ricciardo and Valtteri Bottas were voted driver of the day on three occasions. Ricciardo pips the Finnish driver with more second places, but both put on a fantastic show throughout the year to capture fan's imaginations. 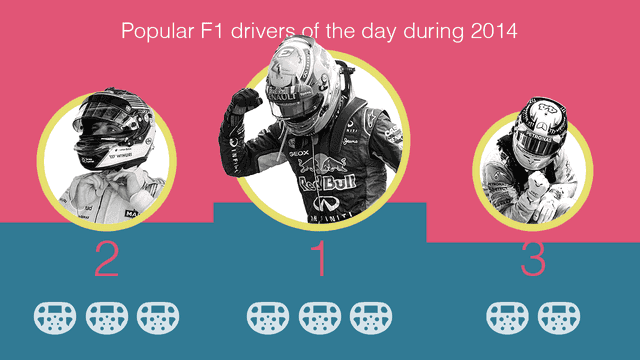 Hamilton, meanwhile, was left in third place with only two driver of the day votes. He appeared in the voting options many times during 2014, but perhaps due to the dominance of the Mercedes car, his endeavours were treated less favourably as the season progressed. Fernando Alonso was just behind the world champion, with two driver of the day votes but only one second place to Lewis' six. The top four are the same as in the end of season results, then, but with the order of seniority slightly reversed. Eight other drivers picked up a driver of the day win, including Nico Rosberg, Jenson Button and Felipe Massa. With all these quality racers remaining in the sport for another season, I can't wait to see how the ratings turn out in 2015! Sidepodmeetup: How many reasons do you need?